What’s in and what’s out this season at Men Fashion Week in Milan and Paris? Regardless how amazing the collection could be, what’s behind the best fashion shows is the good PR and Marketing preparation. With the democratization of fashion, as a consequence of the technology evolution, now brands are fighting for eye balls like a TV show 10 years ago. What’s the biggest challenge every new season is not who will show the best looks and models, but who will come up first with the idea trend-setter, who will use the technology in a way competitors haven’t used it and who will win more fans over social media engagement. There’re some true leaders who consequently are getting the lead also on sales numbers: Burberry, Gucci, Luois Vuitton, Hugo Boss and others. Facebook live streaming, clothes purchase directly from the runway, fashion bloggers live coverage, backstage exclusive content are just part of the new tools brands are using to make the difference. Here are some of the trends set by industry leaders during the latest fashion shows in Milan and Paris that very probably will evolve even more in the Women Fashion Week to come. Burberry was the first brand to introduce real-time shopping from the runway one year ago but this time the product range offered is really impressive – almost all bags and coats from the AW 2012 collection purchasable for a limited period of time. 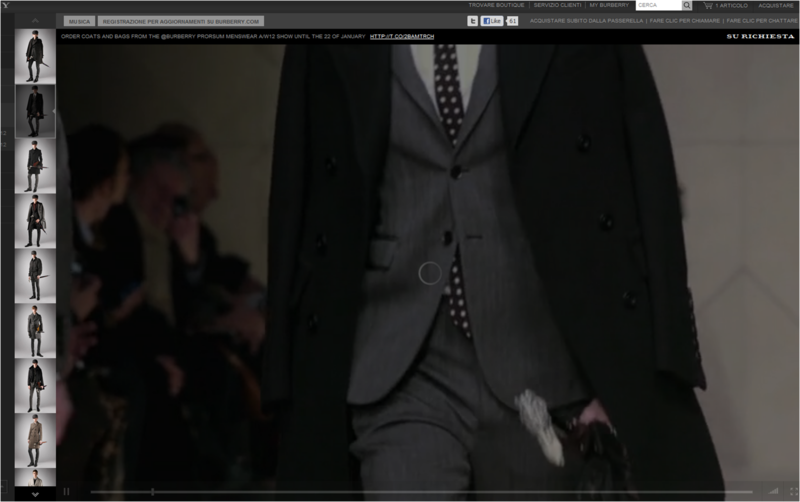 The looks coming out on the runway were shown during the live streaming on a side strip where just after a click you were brought to the check out. Would be interesting to know what was the demand of the users. Other brands are embracing this trend too. Valentino broadcasted its Fashion show directly on the e-commerce site The Corner where viewers could book some items for an early delivery in June. Ermenegildo Zegna introduced their Zegna Live application for iPhone and iPad with the option to buy four products of the new collection with immediate delivery. These brands know their clients and the fact that exclusive access and having something before everybody else excites them. I am sure this trend will continue to evolve even more. Big fashion shows are happening either in Milan, Paris, New York or London during the proper fashion week that suggest a lot of influencers will be gathered in that place at the same time. Location based social media campaigns totally make sense. However, Foursquare is still underused for that matter. Just a few brands made something dedicated to the fashion week. Dolce&Gabbana created their Foursquare tips list “Milan Fashion Week” with some self-suggesting tips and no real users´ incentives to go somewhere and do a check-in. Consequently the fans’ engagement remains rather low. On the other hand Hugo Boss is showing his innovative side this season more than ever. Their Foursquare dedicated list is just a part of all efforts during the fashion week in Berlin. For each check in made on a spot from the list followers get a drink and a Hugo bracelet for free. Now, that’s motivating. But still just 44 people are following the list. 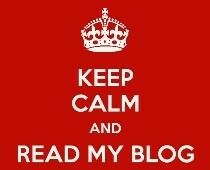 Bloggers are the new celebrities, VIP guests and important journalists. The omnipresence of some of them is getting slightly annoying. However, booking them during the fashion week for a brand initiative must not be so difficult if you act early enough. Hugo Boss has managed to get on board Bryanboy as an official backstage reporter and brand ambassador since they already have done some projects together in 2011. 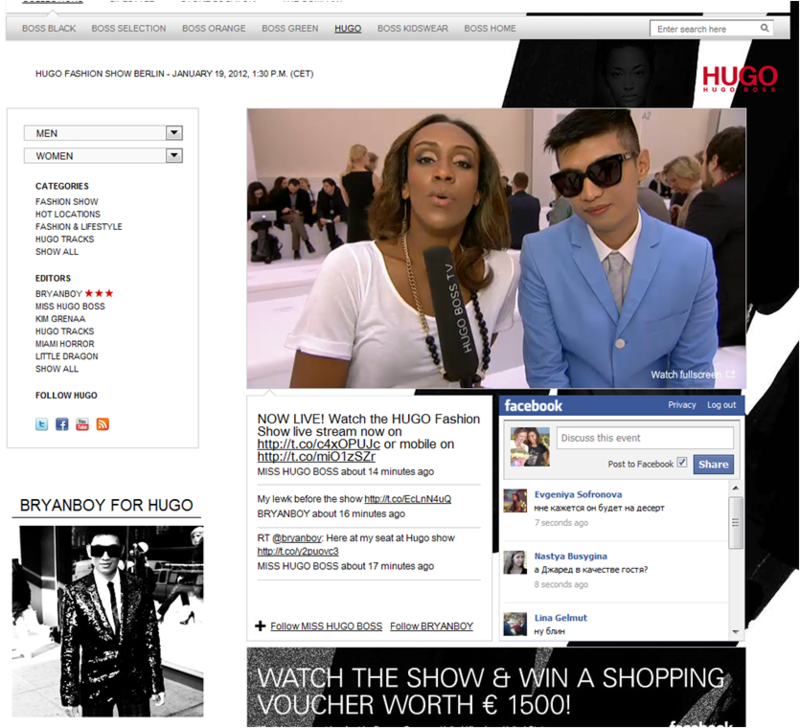 Beside that, on his blog Bryanboy had almost every major men fashion show in live streaming. Not surprisingly at all, having in mind there are not so many well known male fashion bloggers right now. The female version of Bryanboy – Chiara Ferragni from The Blond Salad was also presented and provided a live stream on her blog. Another bloggers relations success is the traditional fashion show live streaming of Gucci – Gucci Connect where users can sign in with Facebook or Twitter account to comment or just follow the live comments of a bunch of international bloggers including TheChicGeek.co.uk, SickByTrend, BagSnob, Horston and others. Talking about traditional PR we can’t deny it’s powerful influence on any special event. Hugo Boss turned its fashion show into a real red carpet ceremony with international celebrities and pre-show interviews with a perfect direct cut. Prada impressed with the flawless looking actors that walked the runway for them – Adrien Brody, Garrett Hedlund, Jamie Bell, Gary Oldman and Willem Dafoe together with the younger models. Now looking forward to Women’s Fashion Fall/Winter 2012/2013 Fashion Shows and what brands will offer this time. The challenge is getting bigger and the stake higher. Can’t wait. Kudos to Burberry for being a trendsetter in adopting technologies and incorporating real-time shopping. I can’t wait to see what they do for the Fall 2012 season! Thank you for your comment and for sharing the show of Academy of Art University! I never saw it before. Good post. It seems likely that alot of brands are embracing these trends. Thanks for sharing.